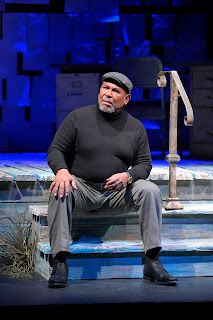 Theatre Eddys: "How I Learned What I Learned"
And thus begins a near-two-hour gentle rambling and remembering of experiences, philosophies, and learnings in which Steven Anthony Jones is most believably, most astonishingly August Wilson. Starring in the one-person autobiographical play that the playwright wrote and first premiered three years before his death in 2002, the much-revered, veteran actor Mr. Jones presents a captivating, enlightening, and often wonderfully humorous How I Learned What I Learned. Directed by Margo Hall with evident love, respect, and admiration for both the playwright and this actor, How I Learned What I Learned opens at Marin Theatre in a joint production with Lorraine Hansberry Theatre and Ubuntu Theatre Project – both of whose stages Mr. Jones will continue to play the role in the weeks to come. 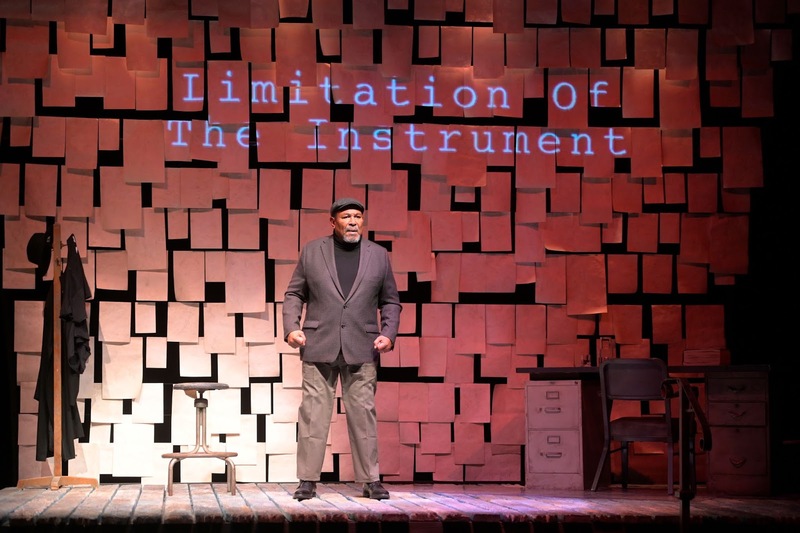 As Steven Anthony Jones recounts August Wilson’s family history, life, and learnings, headline topics are typed across a wall of illuminated hanging papers – a three-dimensional collage designed by Edward E. Haynes, Jr. and luminously accented by Stephanie Johnson’s lighting design. 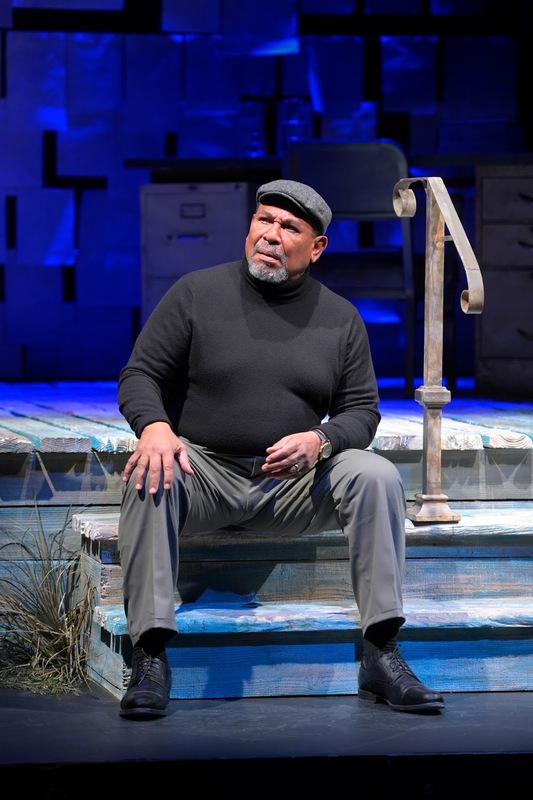 The effect is a lifetime of poetry and play scripts from which Mr. Jones’ August Wilson draws his stories and mini-sermons, while sitting on a wooden-slab porch reminiscent of scenes from one of his family-based plays like Fences. Time and again, August uses humor to land a stark point about the reality of black history in America. Noting his family arrived on these shores in the early 17th century, he wryly states that for the first 244 years, his ancestors had no problem finding work; but that since 1865, “It has been hell.” His mother became part of the “Great Migration” to the North in the early twentieth century, landing in the Hill District of Pittsburgh, where he tells us with a smirk that in 1955 lived 54,997 blacks and three old, white ladies. Those three were the only three whites who came back to a Catholic congregation the week after the monsignor announced that blacks would be welcomed. The influence of August Wilson’s mother on his own development as a person and a writer is a key thread throughout his story. In a particularly poignant moment, Mr. Jones solemnly relates one of the author’s insights after his mother died. “You find out after all those years you have been living in your mother’s prayers, and now you have to live on your own. We meet many of the Hill District’s residents who often became prototypes for characters in Mr. Wilson’s plays. There’s the sax-playing Cy Morocco, “an African lost in America,” who taught a young man who was surprised his love of saxophone did not mean he could just pick it up and play it with no practice that the same principle applied to his desired career. “August, you want to be a writer ... then learn how to do it,” inspiring the happy-go-lucky high-school dropout to take his love of reading and poetry and seek someone who could teach him how to write well. The flow of stories is full of such short portraits of the people who later populated the scenes and scenarios the playwright would recreate of his beloved Hill District. 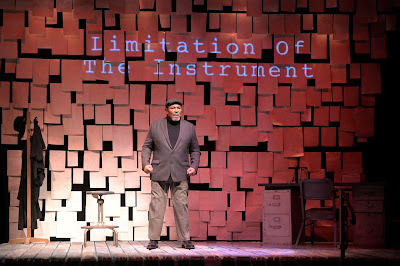 Steven Anthony Jones gives no less than a tour-de-force performance as he embodies the almost larger-than-life persona of the aged August Wilson. His deep, gravely voice hypnotizes the enrapt audience while we also at times want to reach out and help him as he gingerly with some obvious old-age pains makes his way down the porch’s steps. 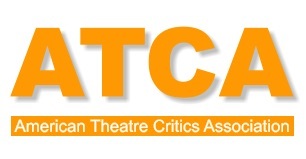 While on the one hand probably few of us wants the evening to come to an end because of the sheer fascination of both the subject and the actor portraying him, in fact the length of the play feels about fifteen minutes too long, especially given no intermission. Frankly, I found myself wondering toward the end how many more titles would be typed on the papered wall to announce yet one more short story. At the same time, I could not help but thoroughly enjoy all, up to the very last one. This three-company production of August Wilson’s How I Learned What I Learned now showing on the Marin Theatre stage must not be missed by anyone who has ever seen even one of the playwright’s works. 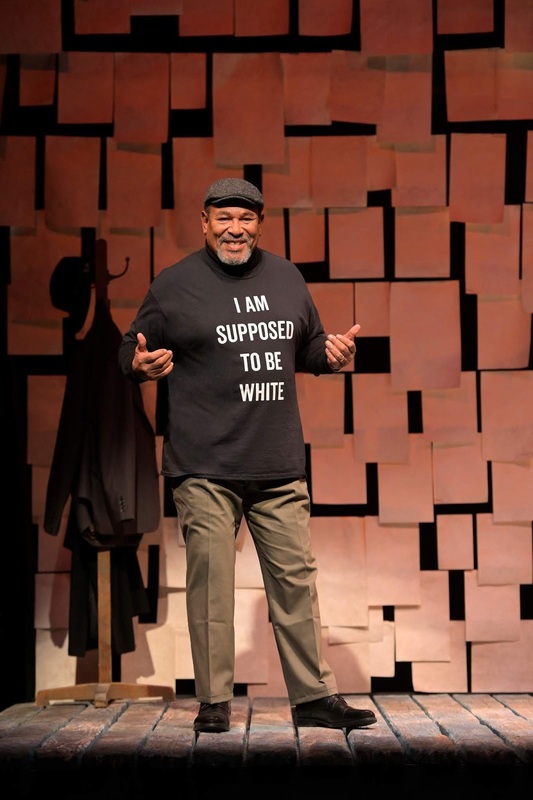 But at the same time, there is so much to be gained about the experience of being African American in a white America even for someone who has never heard of the playwright or his incredible Pittsburgh Cycle. Just to be in the presence of Steven Anthony Jones as he becomes August Wilson is a blessing and a memory that should live in each audience member’s bank for years to come. How I Learned What I Learned continues through February 3, 2019 at Marin Theatre, 397 Miller Avenue, Mill Valley. 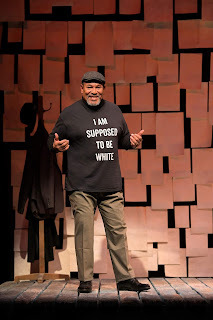 Tickets are available online at https://tickets.marintheatre.org/Online/ or by calling the box office at 415-388-5208, Tuesday – Sunday, noon – 5 p.m.
How I Learned What I Learned continues next at Lorraine Hansberry Theatre, February 14 – 24, 2019 at Buriel Clay Theater, 762 Fulton Street, San Francisco (https://www.lhtsf.org) and at Ubuntu Theater Project (http://www.ubuntutheaterproject.com) at a date to be announced, Waterfront Conservatory & Playhouse, 2010 4th Street, Berkeley.